This tape is a prefect substitute for putty or adhesive. It is not permanent but holds very well. If you remove the tape there is no residue left on the poster. Sticks to block walls, brick, dry wall and even windows. Really good stuff! We found this tape locally last year for our VBS posters. All other methods failed, and we found our posters on the floor the next day. 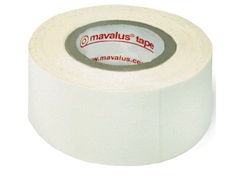 This tape is just as it's name says, mavalus!!. Not one problem did we have with the wall, which was painted sheetrock. It also was easy to remove from the poster. I hope they don't ever stop making this tape.